Ten years ago, I met a skinny French guy named Vincent Rouquette-Cathala for a beer at a bar called Le Fey in Playa del Carmen. I'd only known Vince for a few months, but it was already clear that we were the same: idealistic, tenacious, addicted to cave diving, and at that moment, maybe a little drunk. “I would spend my last penny on cave exploration!” I slurred, as Vince waved down the waiter for another beer. “We should start an exploration team,” he agreed, and we tipsily shook hands. From that moment, Vince became my dive buddy, my exploration partner, and eventually my business partner. 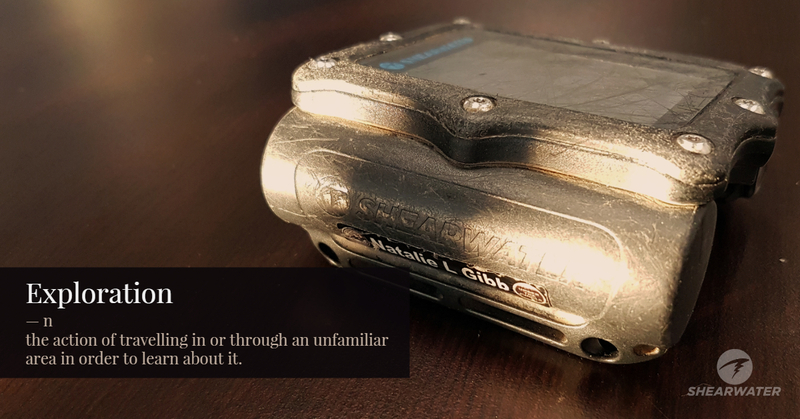 After a decade of exploration, during which we have charted over sixty kilometers of cave passages, our enthusiasm hasn't changed. We continue to blow our business's last peso on cave exploration (which is a terrible business model, but a whole lot of fun), and we have started to find increasingly bizarre caves. Our current project at Cenote Antares definitely falls into the bizarre category. The story of its discovery is as twisting and convoluted as the cave itself. Antares is near a swampy stretch of coastline, characterized primarily by mangrove forests and mosquitos, where we have been exploring for several years. 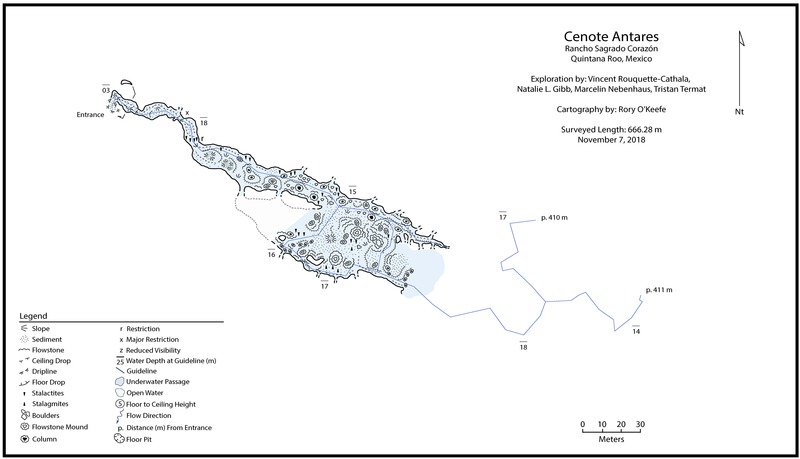 This area clearly has extensive cave development, but very few cenotes, or openings into the underground cave system. Unlike the rocky terrain of the Riviera Maya, where we are based, the land near Antares is covered with thick topsoil which has filled in the cenotes over time. Throughout the jungle, clearings with springy, soft ground indicate where openings into the underground cave systems once were. It's extremely frustrating to know that there are inaccessible caves just meters below our feet. The only way that we have discovered to access caves in the region, is to coordinate with landowners who have cleared debris and mud from these filled-in cenotes to use them as wells. This is more difficult than it might seem. The caves near Antares are not clear like the caves near Tulum. Every system we have found in within 50 kilometers of Antares is murky and contains at least some hydrogen sulfide. The area has never been, and probably will never become, a popular cave diving destination and most landowners are unfamiliar with our sport. To be fair, cave diving is pretty incomprehensible. What do you see down there? Wet rocks. Is the water clear? No. It sort of burns your skin. Is it beautiful? In a way, if you like spooky places. Is it safe? Well, most of the caves in the area are not very stable. Do you make money doing this? No, it's actually pretty expensive to come up here to explore . . . . It's not surprising that many landowners are suspicious of us. Our big break in the region came when a group of dry cavers lead by renowned cartographer Peter Sprouse were invited by a landowner to cave on a nearby ranch, only to discover it was flooded. They passed the lead on to us, and in April of 2018, our team composed of Marcelin Nebenhaus, Vince, and myself, made the first dives into what would become Cenote Dagobah. 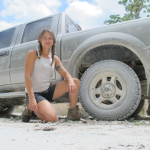 Pleased with the results, the owner recommended us to his friend who also had a cenote nearby, and thus began the chain of acquaintances that resulted in an invitation to visit Cenote Antares. In September 2018, Vince made a scouting dive into Antares. 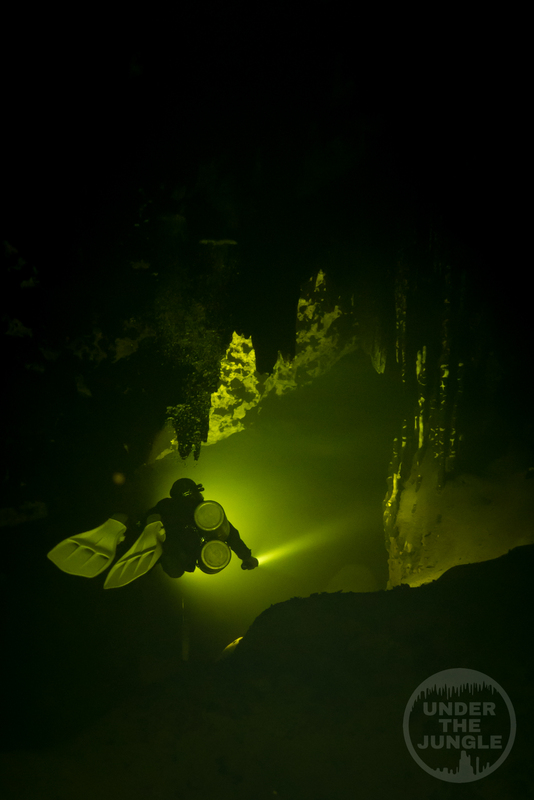 The cenote was bright yellow from microbial growth and high concentrations of hydrogen sulfide, and the steps to the cenote were covered in thick microbial mats. It was honestly pretty gross. We were surprised to find an old guideline tied to the steps. It was also encrusted with microbial goo. According to the landowner, Don Valentín, this line was placed by an unknown diver, who had entered the cave several years ago, made a short dive, and never returned. Vince followed the existing guideline through zero visibility microbial soup, cleared a major restriction, and continued a short distance further into the cave, where the visibility cleared to several meters. After about 50 meters the existing guideline ended. Vince deployed his reel to continue the line up a slope and through a minor restriction. After this second restriction, the cave opened into a massive chamber, where Vince found himself floating under a smokey hydrogen sulfide cloud. Hills of tan microbial sediment stretched in all directions, with drifts of sediment covering fallen stalactites embedded in the floor. The dripstone formations hung from the ceiling in jagged shapes, and appeared to have been partially dissolved by the acidic water. The chamber was wider than Vince could see, but with only five meters of visibility, that wasn't very far. Still, the place felt massive and he was able to empty his reel, leaving about 300 meters of line in the tunnel. Throughout autumn, our team returned several times to Antares to continue the exploration. Low visibility combined 40-meter wide tunnels made exploring the cave difficult, it was tricky to determine where to go without passage walls as a reference point. As of January 2019, we have explored only 650 meters of passage, and it's been hard-fought. The main tunnel appears to pinch down, but we have not given up hope of working around the tight area at the current end of line. Our resident cartographer Rory O'Keefe is currently mapping the cave. For me, the most exciting discovery happened in late December. I returned with a team to create a short video for the landowner, who was enthusiastic to see how his cave looked underwater. We arrived at Antares to find shockingly clear water at the entrance. The yellow color was gone, the microbial growths on the guideline and stairs had disappeared, and the water was a clear, emerald green. It appears that the microbial bloom in the entrance is seasonal, and disappears during the cooler months. 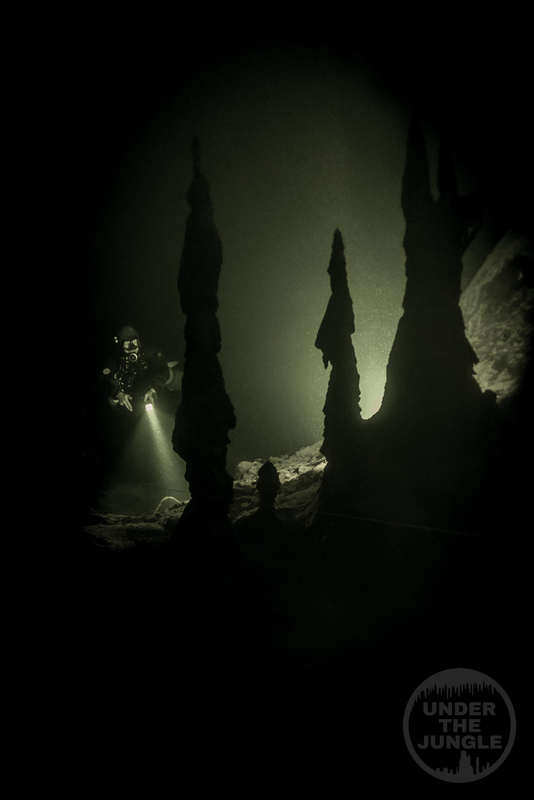 During the two days of the film shoot, we were treated to clear visibility, even in the main cave passage. The water maintained its emerald green tone, allowing us to capture vibrant images completely atypical of common Mexico caves. The incredible visibility revealed several leads that our team had missed during the murky months, and it took some serious willpower to focus on the filming project instead of grabbing my exploration reel and taking off into the cave. The small video project had an unexpected consequence. After posting the short film on social media, a local cave instructor, Tristan Termat, approached me about the video. He was the original explorer, and had placed the short line on a scouting mission several years ago, but between difficulties coordinating with the landowner and the remote nature of the project, he never managed to return to continue the exploration. He's not too enthusiastic about going back to the site, but was interested to learn that the cave continues. Cenote Antares has mysteries yet to reveal. 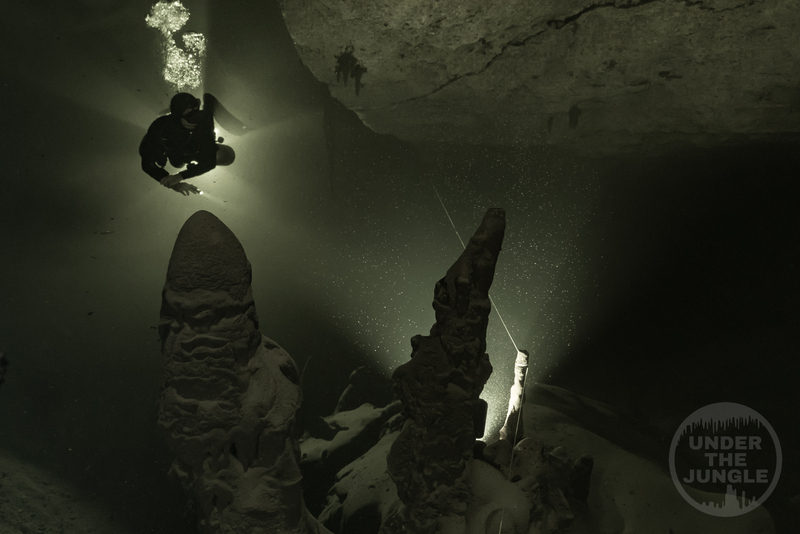 We plan to continue the exploration and mapping projects, and with the improved winter conditions, we hope to begin to bring advanced cave divers to the site. While the cave entrance is snug and hydrogen sulfide isn't for everyone, for daring divers, the chance to fly through jade-green water and view unusual formations may make the significant expense and time required to visit Antares worthwhile. When Vince and I first shook hands over a beer, I had a dream of what we would accomplish one day as explorers, but our partnership has taken us to places that even my overactive imagination couldn't conceive. Cenote Antares is one of those unfathomable places. After a decade of working together, I have the feeling that Vince and my adventures are only beginning, and that there are caves enough to fill a lifetime of exploration. Here's to the next ten years! RANCHO SAGRADO CORAZÓN from Natalie Gibb on Vimeo. Thanks for sharing , beautiful images. Safe Diving.